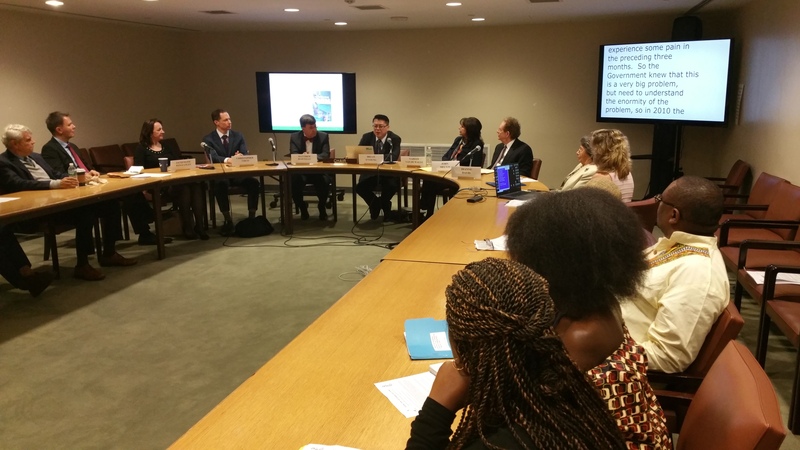 In recognition of the Convention on the Rights of Persons with Disabilities (CRPD), ISPRM and its ISPRM UN Task Force organized a side event during the 11th session of the Conference of States Parties to the CRPD (COSP11) on June 12, 2018 at the UN Headquarters in New York. Titled ‘Chronic Pain: Sustainable Solutions’ this side event session highlighted various sustainable solutions for the treatment of chronic pain globally. The session was chaired by Bryan O’Young, MD (ISPRM-UN Liaison Committee; Advisory Board, ICCC; Physical Medicine and Rehabilitation Residency Program Director, Medical Director of Physiatric Pain Management, Geisinger Health System; Clinical Professor, NYU School of Medicine; Adjunct Clinical Professor, Weill Cornell Medical College). John Melvin MD (Chair, ISPRM-UN Liaison Committee; Emeritus Professor, Sidney Kimmel Medical College at Thomas Jefferson University) and Dianne Davis PhD (Founding President, International Council for Caring Communities (ICCC)) served as moderators. and was followed by Bryan O’Young, MD, ‘Finding Meaning in Chronic Pain: A Sustainable Solution’. Department of Rehabilitation Medicine, Montefiore Medical Center) then presented ‘A Novel Non-Narcotic Approach to Pain: Virtual and Augmented Reality’. ‘Finding Sustainability in Osteoarthritic Pain Management using Existing Resources’ was presented by Christopher Visco, MD (Ursula Corning Associate Professor of Rehabilitation Medicine Research, Vice Chair of Education, Department of Rehabilitation and Regenerative Medicine, Columbia University College of Physicians and Surgeons; Residency Program Director, Physical Medicine and Rehabilitation, Sports Medicine Fellowship Director, New York-Presbyterian Hospital, Columbia, and Cornell) and Jacqueline Winstanley (ICCC Co-Chair Friends of the Society for Agequake Student Designers; Trustee, Disability Rights UK; Founder CEO, Universal Inclusion) concluded the session with ‘Inclusive Entrepreneurship – Key to Reducing Poverty in People with Chronic Pain’. Presentations were followed by a lively discussion with emphasis on effective sustainable solutions to address chronic pain globally. James Gosney, MD (ISPRM) assisted with event coordination. The overarching theme of COSP11 was “Leaving no one behind through the full implementation of the CRPD”. The event was co-sponsored by ISPRM partner NGO International Council for Caring Communities (ICCC). Established in 1993, ICCC responds to the challenges and opportunities of a rapidly aging global population by identifying successful strategies and creative solutions and encouraging their replication and adaption in both developing and developed countries. 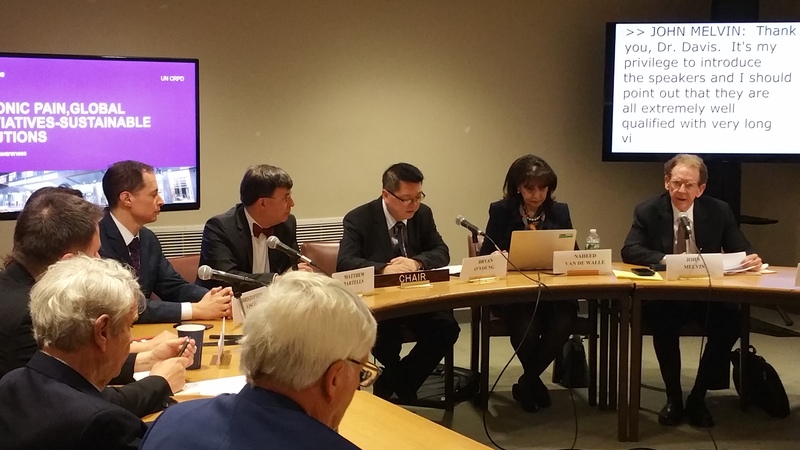 Session Moderator Dr. John Melvin introducing speakers at COSP11 ISPRM-ICCC side event UN HQ. 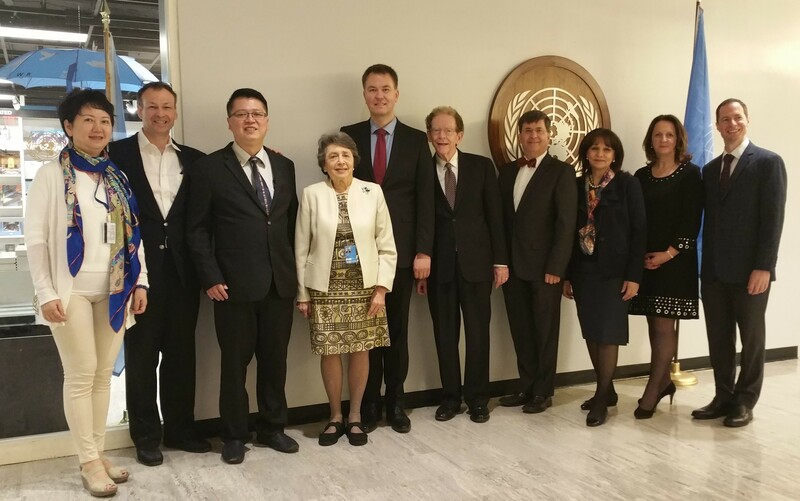 Session Chair Dr. Bryan O’Young presenting at COSP11 during the ISPRM-ICCC side event at UN HQ.